Herne Hill railway station is in the London Borough of Lambeth, South London, England, on the boundary between London fare zones 2 and 3. Train services are provided by Thameslink to London Blackfriars, Farringdon, St Pancras International and St Albans on the Thameslink route and by Southeastern to London Victoria (via Brixton) and Orpington on the Chatham Main Line. It is 3 miles 76 chains (6.4 km) down the line from Victoria. The station building on Railton Road was opened in 1862 by the London, Chatham and Dover Railway. Initial service was only to Victoria, but by 1869 services ran to the City of London, King's Cross, Kingston via Wimbledon, and Kent, including express trains to Dover Harbour for continental Europe. The arrival of the railways transformed Herne Hill from a wealthy suburb with large residential estates into a densely populated urban area. Herne Hill railway station sits at the bottom of the hill that gives the area its name and is close to Brockwell Park. The section of Railton Road outside the station is mixed usage for pedestrians and vehicles. The Chatham Main Line and Sutton Loop railway lines through Herne Hill are elevated above road level on a brick viaduct that runs north–south. The station's 1862 Gothic, polychrome brick building is on the western side of the viaduct, with access the station also from the east via a foot tunnel from Milkwood Road. The building houses a ticket office and newsagent, and was Grade II listed in 1998: the listing notes the station's arched doorways, Welsh slate roof and decorative brickwork. It was described by Cherry and Pevsner as a "handsome group" and featured on the cover of a book about London's railway architecture. The station entrance canopy (which had been shortened and altered in the mid 20th century) was removed in 2015 due to its disrepair and a new one installed in July 2016 with a new timber valance design and cornice based on the original Victorian one. The four tracks are served by two island platforms; northbound trains call at the western platform and southbound trains the eastern platform, providing cross-platform interchange between the two routes. There are flat junctions at each end of the station: Herne Hill North Junction, where the lines to Loughborough Junction and Brixton diverge; and Herne Hill South Junction, where the lines to West Dulwich and Tulse Hill diverge. Thameslink and Southeastern services cross each other's paths at the junctions, constraining capacity on both routes. The station also has a turnback siding on its eastern side, adjacent to Milkwood Road. The area now known as Herne Hill had been a rural part of the Manor of Milkwell since the 13th century. Two tributaries of the River Effra met at the undeveloped site of the future station; it was known as Island Green until the 18th century. In 1783 a timber merchant, Samuel Sanders, bought Herne Hill from the Manor. Sanders granted leases for large plots of land to wealthy families – John Ruskin spent his childhood at an estate on Herne Hill. The Effra was covered over in the 1820s; and the area had become an upper-class suburb by the mid-19th century (a contemporary author referred to the hill as "the Elysium" for merchants). The opening of the railway station, which provided convenient and cheap access to central London, started the urbanisation of Herne Hill. All of the large estates were eventually cleared to make way for many smaller houses. An 1870 railway travel guide noted the population of Herne Hill was 701; the contemporaneous development of new residential streets would increase the population by 3,000. A railway line through Herne Hill was proposed in 1852 by the Mid Kent and London and South Western Junction Railways Company. No construction work was undertaken at that time and the company had ceased to exist by 1860. In the late 1850s, the East Kent Railway had ambitions to run passenger trains between Kent and London, but it did not own any railway lines in inner London. It reached an agreement with the London, Brighton and South Coast Railway (LB&SCR) in 1858 to use its West End and Crystal Palace line to access Battersea and (from 1860) Victoria. This arrangement incurred costly access fees, but it was necessary until the company obtained Parliamentary authority to build in London. On 6 August 1860, the Metropolitan Extensions Act granted the London, Chatham and Dover Railway (LCDR; the successor to the East Kent company) the powers to build three inner London lines: Beckenham Junction to Herne Hill (4 miles 21 chains or 6.9 kilometres); Herne Hill to Farringdon (4 mi 32 chains or 7.1 km); and Herne Hill to Battersea to connect with the lines into Victoria (2 mi 65 chains or 4.5 km). The route from Beckenham Junction to Battersea closely resembled that of the 1852 proposal, going via Clapham, Brixton, Herne Hill, Dulwich and Sydenham. An illustration from The Building News; note the stairway on the left for accessing the upper floor, and the wider canopy. Herne Hill station and the first section to be completed, from Victoria to Herne Hill via Stewarts Lane and Brixton, opened on 25 August 1862. The station was designed by architect John Taylor and railway engineers Joseph Cubitt and J.T. Turner. The building was intended to impress: it had tea rooms offering buffets, decorative brickwork and a tower (which also served the practical function of concealing the water tank for steam locomotives). The Building News described the station in 1863 as "spacious and convenient ... and of the very best quality". It also stated that "an unusual amount of decorative taste has been displayed" in the station's construction; even the viaduct was praised as "one of the most ornamental pieces of work we have ever seen attempted on a railway" for its fine brickwork. The station's design prompted the journal to write a 2,000-word editorial bemoaning the comparatively poor architectural quality of other contemporary civil engineering projects. An architectural critic later noted the station was "eulogised" by journals upon its opening and that its architecture was still seen as exemplary at the end of the 19th century. There were initially two platforms, up and down. The up platform was accessed from the upper floor of the station building via a stairway outside the building. The station's original signal box, elevated above the railway viaduct at the junction between Norwood Road and Half Moon Lane, was a prominent feature in Herne Hill for many years. The land for the station was compulsorily purchased from the estate of Thomas Vyse (died 1861), manufacturer of straw hats and owner of the Abbey, an estate at 70 Herne Hill; the station and much of the viaduct were built on part of the Abbey's grounds. A new road (Station Road) was built from the junction of Norwood Road and Half Moon Lane, Herne Hill's main thoroughfare, to the station. The line from Beckenham Junction reached Herne Hill from the south in July 1863, connecting the station to the LCDR's lines in Kent, and finally allowing the LCDR to avoid using the LB&SCR's tracks to access Victoria from Kent. On 6 October 1863, the City Branch opened from Herne Hill as far as Elephant & Castle, via Camberwell and Walworth Road (the platforms at Loughborough Junction, now the closest station to Herne Hill, opened in 1872). By June 1864, the City Branch had been extended to Blackfriars Bridge railway station (on the south bank of the River Thames) via Borough Road. Blackfriars Railway Bridge was then built across the Thames and a terminus for trains from the south opened at Ludgate Hill on 1 June 1865. Snow Hill tunnel opened on 1 January 1866, enabling trains from Herne Hill to reach Farringdon and completing the Metropolitan Extension. Later that year, the LCDR completed work to widen the railway viaduct between Herne Hill and Blackfriars Bridge, which included doubling the number of lines north of Loughborough Junction from two to four. In 1868, the LB&SCR opened a suburban line from London Bridge to Sutton via Tulse Hill. A 1 mi (1.6 km) extension from Tulse Hill to Herne Hill opened on 1 January 1869. From July 1863, LCDR trains between Victoria and Kent ran through Herne Hill, and to continental Europe via a connecting steamboat from Dover Harbour to Calais; these boat trains left Victoria and Ludgate Hill simultaneously and were joined at Herne Hill. Express journeys from Herne Hill to Dover, a distance of 74 mi (119.1 km), took 1 hour 36 minutes, at an average speed of 46.25 mph (74.4 km/h). Services to London were split at Herne Hill to give passengers easier access to the City of London and beyond; the LCDR began operating direct services to King's Cross and Barnet (now High Barnet Underground station) from Herne Hill when Snow Hill tunnel opened. A popular workmen's train (one penny per journey) ran between Ludgate Hill and Victoria via Herne Hill from 1865. Trains left from both termini at 04:55 and returned at 18:15. The LCDR was compelled to operate this service by Parliament to compensate for the large number of working-class homes destroyed in Camberwell during the construction of the City Branch. Regular one-way fares to Ludgate Hill were eightpence, sixpence and fourpence for first, second and third class respectively (or return for one shilling, ninepence and sevenpence respectively), with journey times of 15 minutes on express trains and 26 minutes when calling at all stops. Both the Great Northern Railway (GNR) and the London and South Western Railway (LSWR) helped fund the Metropolitan Extensions (£320,000 and £310,000 respectively; £29,520,000 and £28,600,000 in 2018) in return for the right to use the LCDR's tracks. The GNR ran trains between Hatfield and Herne Hill from August 1866 until March 1868 (when the trains were diverted to Victoria via Loughborough Junction); this was a busy all-stops service, with 15 trains leaving Hatfield and 14 leaving Herne Hill every day. The LSWR began running trains between Ludgate Hill and Wimbledon via Herne Hill when the Tulse Hill extension was completed. Some of these services went as far as Kingston until the mid-1890s. By 1870, a track had been added to the east of the station and two sidings had been added to the west; one of the western sidings was a bay platform for passenger trains, which was accessed from the platform adjoining the upper floor. Interlocking signalling was in use at Herne Hill by 1880. The LCDR enlarged the station in 1884 to meet growing demand: the viaduct was widened to allow for the construction of a second island platform and two lines to the east (the easternmost line was used only for freight); and the foot tunnel under the viaduct was opened. In 1885, the LCDR decided to use Blackfriars Bridge railway station solely as a goods yard but lacked the space to sort wagons at the site. It purchased 14 acres (5.7 ha) of land between Herne Hill and Loughborough Junction for this purpose. The Herne Hill Sorting Sidings had some 35 sidings, the longest of which was 940 ft (286.5 m). A stationmaster's house was built at 239 Railton Road in the mid-1880s as the site offered a good view of the station (it is now privately owned). In 1888, Railton Road was extended to the Norwood Road/Half Moon Lane junction and Station Road ceased to exist. At the beginning of 1899, the LCDR and the neighbouring South Eastern Railway (SER) combined their operations as the South Eastern and Chatham Railway (SECR), jointly owned by the two railways. The SECR ran the trains, but the lines and stations continued to be owned by the LCDR or SER. In 1900, it was suggested in The Contemporary Review that the City Branch should be replaced with an electric deep-level railway (i.e. a 'tube' line) between Herne Hill and Farringdon in order to remove Blackfriars Railway Bridge, which the author considered to be a blight on the Thames. A late-night service from Ludgate Hill (departing 01:15) to Beckenham Junction via Herne Hill began in 1910. The intention was to satisfy journalists on Fleet Street who regularly complained in print about the poor quality of service on the line; those working on the morning papers often worked beyond midnight and missed the last train. Services to Farringdon from Herne Hill were discontinued in 1916 with the closure of Snow Hill tunnel to passengers, and trains from the south terminated at Holborn Viaduct. The LCDR amalgamated with the LB&SCR, SER and several other railways to form the Southern Railway at the start of 1923. Work began on electrifying the former LCDR suburban routes in 1924. Herne Hill station was extensively remodelled as part of these works: the eastern island platform was lengthened; the original island platform was demolished and replaced by one further west, allowing two tracks to be laid between the island platforms; the western sidings were removed; and the upper floor was closed to passengers. On 12 July 1925, a 660-volt third-rail system came into operation on both routes through Herne Hill, from Victoria to Orpington on the Chatham Main Line and along the entire length of the City Branch. Electric trains ran every 20 minutes on both routes during the day and were kept overnight at the sorting sidings north of the station. The distinctive signal box overlooking Norwood Road and a similar signal box at the northern end of the station were demolished in 1956 and replaced by a single signal box adjacent to the north junction. The replacement signal box was in use from June 1956 until December 1981, when its functions were transferred to Victoria; the building still exists and is used by railway staff. The signalling at Herne Hill was upgraded from semaphores to colour lights on 8 March 1959 as part of the Kent Coast electrification plan. By 1959, the pattern of commuter services at Herne Hill had taken the shape it held into the 21st century: all-stops trains from Victoria to Orpington and from the City of London to Wimbledon and Sutton (but, unlike the modern Sutton Loop, via West Croydon). However, there was a decline in the number of electric trains on the Chatham Main Line through Herne Hill in the years after the war. Immediately after electrification in 1925, six trains used the route between Herne Hill and Shortlands in each direction during every off-peak hour. By 1960, it had dropped to two trains in each direction. The Herne Hill Sorting Sidings closed on 1 August 1966 and the freight line to the east of the station was taken out of service. Nothing of the sidings remains: residential accommodation has been built along Shakespeare Road (on the western sidings) and commercial premises have been built along Milkwood Road (on the eastern sidings). In 1988, Snow Hill tunnel re-opened and the former LCDR City Branch formed the basis of the new Thameslink route. Network Rail began a major upgrade of the route in 2009. A key objective of the Thameslink Programme was allowing more trains to travel between central London and Brighton, which was prevented by a bottleneck between London Bridge and Blackfriars on a viaduct through the historic Borough Market. Network Rail initially suggested widening the viaduct and demolishing part of the market, but the public backlash against this plan prompted Network Rail to consider permanently routing all Thameslink trains to/from Brighton via Herne Hill, avoiding London Bridge and the market. This would have required the grade separation of the two lines through Herne Hill, which would have been achieved by constructing a new viaduct immediately to the east of the existing viaduct and using a fly-over to connect the southern end of the new viaduct to the line between Tulse Hill and North Dulwich (taking the tracks over the Chatham Main Line and towards Tulse Hill). This proposal was rejected in 2004 because of its environmental impact on Herne Hill and the larger number of interchanges offered on the London Bridge route; the Borough Market viaduct was widened instead. From December 2008 to May 2012, Thameslink trains serving Herne Hill did not run most weekends or after 22:30 every week-night because of construction work on the Thameslink route through central London as part of the Thameslink Programme. During the initial planning in the late 1980s for High Speed 1, British Rail considered building the line to serve a low-level station at King's Cross via south London. An option for this route was via Herne Hill, which would have required quadrupling the tracks on the Chatham Main Line between Shortlands and Herne Hill and on the City Branch to Loughborough Junction; it was estimated that this would have led to the loss of 90–180 homes in Lambeth. Although both a different route and London terminus for HS1 were eventually chosen (St Pancras via East London), Eurostar services linking London Waterloo to Brussels and Paris passed through Herne Hill without stopping from 1994 until the completion of HS1 in November 2007. This marked the end of rail services to the continent via Herne Hill, which had been started by the LCDR in 1863 when the line between Victoria and Dover via Herne Hill was completed. The upper floor of the station, which had not been used by passengers since 1925, was converted into 3,000 sq ft (278.7 m2) of office space in 1991 and rented as 'Tower House' (after the station's distinctive tower). The disused freight line to the east of the station was partly reopened in 2009 as a siding for use by Thameslink trains to compensate for the loss of sidings when the Moorgate Thameslink branch was closed. The line's connection to the south junction was severed during these works. The station had become fully accessible by 2010: lifts were installed to provide step-free access to the platforms in 2008 and a unisex disabled-accessible toilet was opened on the southbound platforms in 2010. Trains through Herne Hill were affected by World War II. Trains on the City Branch were reduced from September 1939 to once every 30 minutes during the week and hourly at weekends; and the line was cut twice during the Blitz. On the second occasion, the railway bridge over Hinton Road (immediately south of Loughborough Junction) was destroyed. The route between Holborn Viaduct and Herne Hill was disrupted by 62 incidents during the war. On 6 November 1947, a steam train approaching from West Dulwich passed a signal at danger in heavy fog and crashed into an electric train crossing the station's south junction towards Tulse Hill. One passenger on the electric train was killed and nine others were hospitalised. A minor accident occurred on 30 June 1957. A light engine travelling towards Tulse Hill was waiting to cross the south junction when it was struck from behind by an express passenger train from Victoria that had passed a signal at danger. The driver of the light engine and two passengers from the express were hospitalised but quickly discharged. A second fatal collision occurred at the sorting sidings, just north of the station, on 1 April 1960 in fog that reduced visibility to 60 ft (18.3 m). 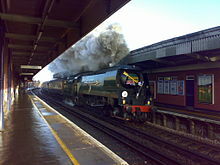 A steam locomotive was waiting on the southbound track outside Herne Hill for a proceed signal when the signalman cleared an electric passenger train behind the steam locomotive to proceed down the same track. The steam locomotive was struck from behind, destroying it and killing the electric train's driver. The route through the station will be busier from December 2014 to 2018 as Thameslink trains serving London Bridge will be diverted via Herne Hill – an additional four trains per hour in both directions. This is due to the redevelopment of London Bridge that will temporarily close it to Bedford-Brighton trains. The additional trains will not call at Herne Hill; they will run fast between London Blackfriars and East Croydon. It would not be possible for the 12-car peak trains to call at Herne Hill as the platforms are too short and it would not be viable to use selective door operation as the carriages not on the platforms would foul the junctions. Network Rail, in its July 2011 London & South East route utilisation strategy, recommended that all services from Herne Hill towards Blackfriars should terminate in the bay platforms at Blackfriars after London Bridge's redevelopment is completed in 2018 and the diverted Thameslink trains return there. Passengers from Herne Hill would then have had to change at Blackfriars to travel further north. Network Rail made this recommendation because more services will be using the route between St Pancras and London Bridge from 2018; sending trains from Herne Hill to the terminating platforms on the western side of Blackfriars (instead of the through tracks on the eastern side of the station) would have removed the need for them to cross in front of trains to/from Denmark Hill and trains to/from London Bridge at junctions south of Blackfriars. In January 2013, the Department for Transport (DfT) announced that trains serving the Sutton Loop Line (also known as the Wimbledon Loop) will continue to travel across London after 2018. The number of trains calling at Herne Hill on the route will remain unchanged, with four trains per hour. The DfT also decided the Sutton/Wimbledon Loop will remain part of the Thameslink franchise until at least late 2020; following which the route is now served by the Class 700 trains. In the longer term, Network Rail has forecast that by 2031 there will be 900 more passengers attempting to travel on the route between Herne Hill and Blackfriars during the busiest peak hour every weekday than can be accommodated on the trains. It is anticipated that eight-car trains with higher capacity (similar to the Class 378 trains used on inner London metro routes) will eventually be required to address this shortfall. The route from Victoria to Orpington via Herne Hill is projected to be amongst the most congested and overcrowded in South East London by 2026. Network Rail is considering grade-separating the two lines passing through Herne Hill so that trains would not cross each other's paths at the station's junctions; this restricts the number of services that can pass through the station. A 2008 route utilisation strategy for South London concluded that this improvement will not be required before 2020 but recommended safeguarding the required land. Grade-separation is supported by Southeastern and First Capital Connect believed it should be given more consideration, but Network Rail has stated that it would be difficult to carry out the work because the station is on a viaduct and surrounded by buildings. The 2011 route utilisation strategy, which examined options for congestion relief at Herne Hill before 2031, did not suggest grade-separation as an option in the 2011–2031 period. This project would also enable the platforms at Herne Hill to be lengthened to accommodate 12-car trains as the current northern junction, which prevents them from being extended, would be removed. However, longer trains could not be used on the Sutton/Wimbledon Loop without also rebuilding Tulse Hill and Elephant & Castle. The congestion within the station itself has been noted by Network Rail and it is keeping the situation under review. Transport for London (TfL) has recommended that specific improvement works (new entrance doors, removal of interior wall, wider stairs to platforms and second station entrance) be carried out between 2014 and 2019. TfL has also suggested there may be potential for the turnback siding adjacent to Milkwood Road to be converted for passenger use. This would require substantial changes to the station as there is no direct access to the platforms from Milkwood Road and the current subway for accessing the platforms does not extend east of the southbound platform. The Mayor of London published a long-term vision for the London Overground in February 2012. It recommends that all London suburban rail services should eventually be devolved to TfL and that suburban services currently provided by Southeastern be devolved before 2020 to demonstrate the benefits of this approach. Southeastern's suburban services include the route between Victoria and Orpington via Herne Hill. TfL had announced that it would bid in late 2012 to have more involvement in these services after the expiration of Southeastern's franchise in early 2014, but the DfT announced in March 2013 that Southeastern's franchise was being extended until mid-2018. TfL has considered extending the Victoria line to Herne Hill to provide faster turnaround at the southern end of the line. The extension is not a priority for TfL as it has a weaker business case than other infrastructure projects. On Sundays, northbound Sutton/Wimbledon Loop trains alternate between terminating at Blackfriars and Luton. Late-night Sutton/Wimbledon Loop services (21:57 onwards) run to Bedford from Monday-Saturday and terminate at Blackfriars on Sunday. London Buses routes 3, 37, 68, 196, 201, 322, 468 and 690 and night routes N3 and N68 serve the station. ^ "Station facilities for Herne Hill". National Rail Enquiries. Retrieved 29 May 2013. ^ a b c d e f g h "Station usage estimates". Rail statistics. Office of Rail Regulation. Please note: Some methodology may vary year on year. ^ Herne Hill Society (2011). A Short History of Herne Hill. London: Herne Hill Society. p. 13. ISBN 978-1-873520-83-3. ^ a b Cherry, Bridget; Pevsner, Nikolaus (1983). Buildings of England, London: South, Volume 2. London: Penguin. p. 363. ^ Historic England. "Herne Hill railway station, entrance block only (1376144)". National Heritage List for England. Retrieved 20 April 2012. ^ Symes, Rodney (1973). Railway Architecture of Greater London. Reading: Osprey Publishing. Cover. ISBN 978-0-85045-123-8. ^ Wilson, G.R.S. (1948). Railway Accidents: Report on the Collision which occurred on 6th November, 1947, at Herne Hill on the Southern Railway (PDF). London: Ministry of Transport. Point of collision diagram. Retrieved 20 April 2012. ^ Brown, Joe (2009). London Railway atlas. Hersham: Ian Allan. p. 32. ISBN 978-0-71103-397-9. ^ Network Rail, March 2008, p. 54. ^ Survey of London 1956, pp. 141–145. ^ a b Talling, Paul (2011). London's Lost Rivers. London: Random House. p. 54. ISBN 978-1-84794-597-6. ^ Wilson, James (1973). The story of Norwood. London: London Borough of Lambeth. p. 10. ISBN 978-0-9501893-3-8. ^ Survey of London 1956, pp. 1–17. ^ Hone, William (1830). The Every-day Book and Table Book (Volume 2). T. Tegg. p. 557. ^ a b Survey of London 1956, pp. 146–154. ^ Long, Helen C. (1993). The Edwardian House: The Middle-Class Home in Britain, 1880–1914. Manchester University Press. p. 55. ISBN 978-0-7190-3728-3. ^ Herne Hill Society (1992). A Glance at the History of Herne Hill. London: Herne Hill Society. p. 7. ^ The ABC; or, Alphabetical railway guide: showing at a glance how and when to go from London to the different stations in Great Britain, and return, etc. London: W. Tweedie. 1870. p. 55. ^ Dendy Marshall & Kidner 1968, p. 327. ^ Turner, John Howard (1978). The London Brighton and South Coast Railway 2 Establishment and Growth. London: B.T Batsford. p. 121. ISBN 978-0-7134-1198-0. ^ White 1961, p. 36. ^ Adams, W.J (1866). Bradshaw's Railway Manual, Shareholders' Guide, and Official Directory. p. 172. ^ a b White 1961, p. 33. ^ Wheeler, Michael (1993). The Lamp of Memory: Ruskin, Tradition and Architecture. Manchester: Manchester University Press. p. 180. ISBN 978-0-7190-3710-8. ^ Course, Edwin (1962). London Railways. London: B.T Batsford. p. 265. ^ Herne Hill Society 2003, p. 10. ^ "London, Chatham and Dover Railway". The Building News. 10: 27. 9 January 1863. ^ "Herne Hill railway station". The Building News. 10: 327. 1 May 1863. ^ Stanford, Edward (1864). Stanford's Library Map Of London And Its Suburbs 1864: East Brixton, South London Railway, London Chatham & Dover Railway, Herne Hill, & Dulwich. ^ "No. 22493". The London Gazette. 19 March 1861. p. 1260. ^ Herne Hill Society 2003, p. 78. ^ a b Herne Hill Society 2003, p. 11. ^ Nock, O.S. (1961). The South Eastern and Chatham Railway. London: Ian Allan. pp. 53, 60. OCLC 254188896. ^ a b White 1961, p. 37. ^ Spinks, Neil (June 1988). Slater, John (ed.). "Thameslink Services a Century Ago". Railway Magazine. Vol. 134 no. 1046. Cheam: Prospect Magazines. p. 364. ISSN 0033-8923. ^ Kidner, R.W. (1952). The London, Chatham and Dover Railway. South Godstone, Surrey: Oakwood Press. p. 10. OCLC 12264028. ^ Reynolds, Siân (2007). Paris-Edinburgh: Cultural Connections in the Belle Epoque. Farnham: Ashgate Publishing. p. 14. ^ Ward and Lock's Pictorial Guide to London. Ward, Lock and Co, Ltd. 1879. p. 36. ^ Willock, H.B (1884). "English Express Trains in 1871; and a Comparison Between Them and Those of 1883". Journal of the Statistical Society of London. Royal Statistical Society. 47 (2): 294. doi:10.2307/2979189. JSTOR 2979189. ^ White 1961, p. 39. ^ a b Jackson 1969, p. 194. ^ White 1971, p. 36. ^ Dendy Marshall & Kidner 1968, p. 333. ^ The ABC; or, Alphabetical railway guide: showing at a glance how and when to go from London to the different stations in Great Britain, and return, etc. London: W. Tweedie. 1870. pp. 10, 55. ^ a b c Jackson 1969, p. 193. ^ Mitchell & Smith 1992, fig. 53. ^ Marshall, W.W. (1988). Old Ordnance Survey Maps Brixton & Herne Hill 1870. Alan Godfrey Maps. ISBN 978-0-85054-151-9. ^ Mitchell & Smith 1992, map VIII. ^ Mitchell & Smith 1992, fig. 54. ^ Dendy Marshall & Kidner 1968, p. 347. ^ "Miscellania". The Builder. The Builder, Covent Garden. 47: 278. 1884. ^ Mitchell & Smith 1992, map IX. ^ White 1971, p. 37. ^ Dendy Marshall & Kidner 1968, p. 332. ^ Mitchell & Smith 1992, fig. 58. ^ Herne Hill Society 2003, p. 14. ^ Dendy Marshall, C.F. ; Kidner, R.W. (1963) . History of the Southern Railway (2nd ed.). Shepperton: Ian Allan. pp. 314, 345, 355. ISBN 978-0-7110-0059-9. ^ Jackson 1969, p. 199. ^ Jackson 1969, p. 201. ^ White 1971, p. 39. ^ Bonavia, Michael R. (1987). History of the Southern Railway. London: Unwin Hyman. p. 26. ISBN 978-0-04-385107-4. ^ Moody 1957, p. 27. ^ Mitchell & Smith 1992, fig. 65. ^ Moody 1957, p. 28. ^ Moody 1957, p. 104. ^ Moody 1957, p. 154. ^ Mitchell & Smith 1992, figs. 60, 64. ^ Jackson 1969, p. 205. ^ White 1971, p. 64. ^ a b Mitchell & Smith 1992, fig. 61. ^ Herne Hill Society (1992). A Glance at the History of Herne Hill. London: Herne Hill Society. p. 5. ^ a b Thameslink 2000 (2004), p. 8. ^ Thameslink 2000 (2004), p. 10. ^ Timpson, Trevor (14 November 2007). "How St Pancras was chosen". BBC News Online. London. Retrieved 19 November 2007. ^ Channel Tunnel International Rail Link (PDF). British Rail. Passenger train routes – Infrastructure and train movements. Retrieved 4 May 2012. ^ Variation to Proposed G1 Network Change: Herne Hill Turnback Facilities (PDF). Network Rail. 2008. Retrieved 20 April 2012. ^ Herne Hill Society Newsletter (PDF). Herne Hill Society. 2008. p. 5. Retrieved 20 April 2012. ^ Moody 1957, p. 107. ^ Moody 1957, p. 114. ^ Moody 1957, p. 115. ^ Wilson, G.R.S. (1948). Railway Accidents: Report on the Collision which occurred on 6th November, 1947, at Herne Hill on the Southern Railway (PDF). London: Ministry of Transport. Retrieved 20 April 2012. ^ McMullen, D. (1957). Railway Accidents: Report on the collision which occurred on 30th June 1957 at Herne Hill in the Southern Region British Railways (PDF). London: Ministry of Transport and Civil Aviation. Retrieved 20 April 2012. ^ Reed, W.P. (1957). Railway Accidents: Report on the collision which occurred on 1st April 1960 at Herne Hill Sorting Sidings signal box in the Southern Region British Railways (PDF). London: Ministry of Transport, His Majesty's Stationery Office. Retrieved 20 April 2012. ^ A new station for London Bridge Archived 1 February 2012 at the Wayback Machine, Thameslink Programme. Retrieved 20 April 2012. ^ a b Network Rail, March 2008, p. 92. ^ a b Network Rail, March 2008, p. 128. ^ Network Rail, July 2011, p. 71. ^ Network Rail, July 2011, p. 20. ^ a b Network Rail, July 2011, p. 72. ^ Network Rail, July 2011, p. 80. ^ "Government safeguards future of the Wimbledon Loop" (Press release). Department for Transport. 21 January 2013. Retrieved 10 January 2015. ^ "Consultation on the combined Thameslink, Southern and Great Northern franchise" (PDF). Department for Transport. May 2012. pp. 11–12. Archived from the original (PDF) on 17 June 2012. Retrieved 1 June 2012. ^ Network Rail, July 2011, p. 102. ^ a b Network Rail, July 2011, p. 139. ^ a b Network Rail, March 2008, p. 145. ^ "Options considered to bridge the gap between present demand and future growth". Response to Route Utilisation Strategy consultation (PDF). Southeastern. 2007. p. 3. Retrieved 20 April 2012. ^ Consultation Response – South London route utilisation strategy (PDF). First Capital Connect. 2007. p. 1. Retrieved 20 April 2012. ^ "Rail Overcrowding". Transport Committee 13 November 2008. London Assembly. 2008. p. 28. Archived from the original on 18 May 2012. Retrieved 20 April 2012. ^ Network Rail, July 2011, pp. 138–139. ^ "Gaps and Options". Network RUS Stations (PDF). Network Rail. 2011. p. 57. Retrieved 20 April 2012. ^ "Summary of recommendations at Strategic Interchanges". Delivering the Mayor's Transport Strategy: National Rail in London (PDF). Transport for London. 2011. p. 71. Retrieved 20 April 2012. ^ "9.4 Gap H: Elephant & Castle corridor". London and South East RUS Consultation Response (PDF). Transport for London. 2011. Retrieved 20 April 2012. ^ Greater London Authority, February 2012. ^ Greater London Authority, February 2012, p. 23. ^ Southeastern 2014, p. 6. ^ Barrow, Keith (26 March 2013). "British government issues revised franchising schedule". International Railway Journal. London. Retrieved 10 January 2015. ^ Thameslink and Great Northern 2014, p. 71. ^ a b Thameslink and Great Northern 2014, p. 12. ^ Thameslink and Great Northern 2014, p. 107. ^ Thameslink and Great Northern 2014, p. 84. Dendy Marshall, C.F. ; Kidner, R.W. (1968). A history of the Southern Railway (Combined Volume). London: Ian Allan. ISBN 978-0-7110-0059-9. Thameslink and Great Northern (2014). Train Times 14 December 2014 to 16 May 2015. Archived from the original on 12 February 2015. Retrieved 10 January 2015. 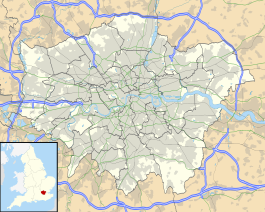 Greater London Authority (February 2012). The Mayor's Rail Vision (PDF). Retrieved 20 April 2012. Herne Hill Society (2003). Herne Hill Heritage Trail. London: Herne Hill Society. ISBN 978-1-873520-46-8. Jackson, Alan Arthur (1969). London's Termini. Newton Abbot: David & Charles. ISBN 978-0-7153-4474-3. Mitchell, Vic; Smith, Keith (1992). Victoria to Bromley South (Southern Main Line). Midhurst, W. Sussex: Middleton Press. ISBN 978-0-906520-98-7. Moody, G.T. (1957). Southern Electric. London: Ian Allan. Network Rail (June 2004). Thameslink 2000: Environmental Statement – Alternatives Report (PDF). Retrieved 20 April 2012. Network Rail (March 2008). South London Route utilisation strategy (PDF). Retrieved 20 April 2012. Network Rail (July 2011). London and South East Route utilisation strategy (PDF). Retrieved 20 April 2012. Sheppard, F. H. W. (1956). Survey of London: volume 26: Lambeth: Southern area. British History Online. Southeastern (2015). Train Times from 11 January 2015 to 16 May 2015. Archived from the original on 3 March 2015. Retrieved 10 January 2015. White, H.P. (1961). A Regional History of the Railways of Great Britain: Greater London. London: Phoenix House. White, H.P. (1971). A Regional History of the Railways of Great Britain: Greater London (New Edition). Newton Abbot: David & Charles. ISBN 978-0-7153-6145-0. Wikimedia Commons has media related to Herne Hill railway station.